A spokesman from the Florida Department of Environmental Protection said in an interview on Thursday afternoon that an inspector visited McIntosh as a result of several complaints filed in late March about the town's handling of the water system. Jeff Prather, DEP spokesman, said a DEP inspector came to talk to the town about the proper procedure for filing malfunction reports and water boil notices when the water system fails. The Thursday meeting was closed to the public, or this reporter would have attended. The McIntosh Mirror made a public record requests at the DEP's press secretary's office and again with Prather for all reports filed by McIntosh in the last few months. However, Prather said there no reports existed. Prather said that as a rule, when there is a malfunction with the water system the town should file a report with the DEP. Prather explained that in late March, the the DEP received a complaint. One of the pumps failed and the town responded very quickly. Prather said he didn't know at the time if a water boil notice was necessary. But he did say that the water is McIntosh is "absolutely safe" and that there is a tremendous amount of oversight that goes into maintaining the water's safety. and that this was not uncommon thing for a town to experience. "Get this clear: They have a very good operator there," Prather said. He said the town's water supply is regularly checked for bacteria twice a month by a certified operator. Prather said that there will be testing of the town's raw water well, including a 20-sample survey. "That doesn't mean that they're doing anything wrong," Prather said. Prather also said he was "glad someone reported the complaints" to the DEP so the issues could be addressed. In the town council meeting last Thursday, after an hour-long public hearing, followed by nearly three hours of council meeting, the council did not bring up the town's recent water concerns or make any updates to the town residents about the status of the water situation. In the last fifteen minutes of the meeting, during citizen comments, resident Susan Phillips raised her hand and asked what was going on with the water. "My water is yellow," Phillips said. "Sometimes I have water and sometimes I don't." Councilman Lee Deaderick asked he she'd like him to respond. "During the last water outage, we had an emergency meeting of which the minutes are available, and took some action to improve the quality of our services," Deaderick said. "There was an inter agency meeting between our staff and the DEP this week and they discussed proper procedures for running municipal water supply. We were a little bit behind, but not a whole lot," Deaderick said. "Actually, they're pretty satisfied with our whole system," Town Clerk Debbie Miller said. She said the town's reporting methods needed some attention. "The reporting was the only thing they were upset about, not that they were upset," she said. Dederick said the DEP was working with the town to improve the reporting systems and the town was working to improve the dependability of the water supply. "The money's been spent and the equipment's been ordered," Deaderick said. Mayor Marsha Strange, who attended the DEP-McIntosh meeting, said the DEP was satisfied with the town. "So it's safe to drink when it's that color?" Phillips said. She said it was that color on Wednesday. Deaderick said he thought it was that color from the hydrant flushing. Phillips asked the council, "Why did they have to come out here?" "Because she [Miller] filed a report, which we're supposed to do," Council President Frank Ciotti said. The McIntosh Mirror made a public record request on Friday following the meeting from the town office by e-mail for any reports filed to the DEP by McIntosh since the DEP spokesman said the DEP never to have received any reports. Any records that become available will be posted. Only when questioned directly by this reporter during citizen comments did the council talk about the complaints made that spurned the meeting. "I think a complaint was filed and they did call and we met with them and they're basically very satisfied with we're doing," Miller said. At 10 a.m. this morning, I was shut out of the McIntosh-Department of Environmental Protection water meeting by the town and the state department. When I drove up this morning to the town office, town clerk Debbie Miller turned the open sign over to closed. She asked what I was there for and I told her I wanted to observe the meeting between the town and the DEP. I first learned of the meeting late last Friday from a concerned resident who called my home to ask if I knew there was a closed meeting planned between the town and the EPA. I then called the town council president, Frank Ciotti. The meeting is actually with the Florida DEP -- rather than the EPA - a federal environmental agency. In a phone interview, Ciotti said that he didn't think they would have a problem with someone observing. At that time, he said several council members were planning to attend, which would have made the meeting subject to Florida's open meetings laws. On Monday, Ciotti sent an e-mail to me saying only one council member would be attending an didn't want any guests. He did not reply to my follow-up e-mail asking if I could attend the meeting or not. Town Clerk Debbie Miller forwarded an e-mail from Dan Shideler, Environmental Specialist for the DEP. "This is not a town meeting where I am involved in a Q&A with the town members. This is me coming out there to let the people in charge of the municipality know what their responsiblities [sic] are to DEP and the public," Shideler wrote. Shideler said this morning that he was there to let town officials know what they needed to do with there was an "issue." I asked if there were any "issues" in McIntosh. He said no. The town has suffered from a water system failure and problems in the last two weeks resulting in periods of zero water pressure. When I asked Miller, Shideler and Council Vice President Howard Walkup each if I could attend this meeting and observe, not asking questions, I was told no and turned away. I specifically asked Walkup, "As a Council member, will you allow me to observe this meeting for the town?" Walkup said, "No, this is not a public meeting." In an e-mail this morning, Council President Frank Ciotti said the town meeting with the EPA this week will be closed. Ciotti wrote that the EPA called and rescheduled the meeting from Tuesday to Wednesday or Thursday. "We asked him to be sure its [sic] before the Town Council meeting so Debbie can report to the Council. He has stated again that this is not a public meeting and does not want any guests. The only folks attending will be Paul, Debbie, Melvin, Marsha, and Howard if available. Sorry for any confusion." Paul and Melvin work with the town on the water system and other maintenance. Debbie Miller is the town clerk. Marsha Strange, the mayor is not a voting member of the town's government. She and Councilman Howard Walkup would be able to attend a meeting dealing with the town's business together. Since only one council member will be present, the meeting would fall outside Florida's Open meetings laws, which states that a meeting between two voting members to discuss anything that could come before the board is a public meeting and must be noticed. I sent Ciotti a reply asking once more if I can attend the meeting. I'll update as information becomes available. McIntosh Town officials will meet with the EPA next week to discuss the proper procedures to take when the town experiences water shortages and failures. In a phone interview this evening, Council President Frank Ciotti said he thought the water system failures from the past week were under control. "I think we're in good shape," Ciotti said. He said they replaced burnt-out parts on the switch. He also said town employees Paul and Melvin had been taking turns standing by the pump to make sure sure it stays operational. Ciotti said a switch has been replaced on the pump. "What happened was the starter switch on pump two kept failing," Ciotti said. He said the town officials would go up to the pump and the switch would be cool and work while they were there. But then it would constantly go on and off and town officials wouldn't know why until they saw the water pressure going down. In an emergency meeting on Monday, the council voted to spend $3,500 to fix the wiring and other expenses. Ciotti said that he did not think the town needed to be under a precautionary water boil notice. "We've asked that question," Ciotti said. "They [EPA] said they don't think so at this point." Ciotti said that there's been no evidence of contamination, or a situation with the system that would cause it. One of the challenges with issuing a precautionary water boil notice is that there is currently no way to contact all of the residents. "If we have a problem, what should we do?" Ciotti said. "Have Paul ride around on a golf cart? Is Debbie supposed to dial 300 phones?" He said the council held off on voting to buy an automatic dialer at the emergency meeting. The cost of the dialer would be another $3,500 - $4,000 on top of the current repair costs. "We're looking for the best solution," Ciotti said. He said that once a dialer is installed, if the water goes off or the water pressure gets down to 25 pounds, the dialer will go off and call everyone, telling them there's a potential water boil situation. Ciotti said while the advantage is that people will be notified, they might also have to deal with water boil notices at 2 a.m. if the water goes out at that time. He said the dialer would be the council's attempt to do the best thing for most of the residents. Ciotti said he's gotten calls from concerned residents about bubbles in the water. He said that's a result of the low water pressure and reiterated that they've been in contact with the EPA. "They've told us to take no action," Ciotti said. "They're coming out on Tuesday about what to do and how to notify people." Other residents called the blog and expressed concern that the EPA meeting with town officials is closed. Ciotti said the EPA did not want to meet with the public, but with town officials. However, if more than one council member is present, then that meeting will fall under Florida's Open Meetings Laws. This reporter plans to attend the meeting on behalf of town residents and has asked Ciotti to notify her regarding the time and place of the meeting. 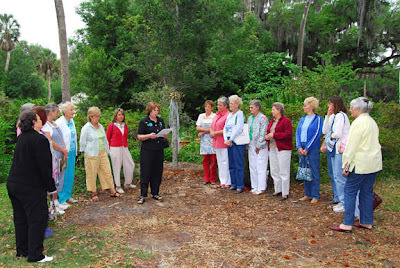 A Dedication Ceremony of a 16-foot Live Oak was held Thursday by the McIntosh Garden Club, along with members Jill Allen and Sean Dowie of the Tree Committee. The Tree was purchased as a gift to the Town of McIntosh by the McIntosh Garden Club and as recognition of this day, April 5 , will become McIntosh’s Arbor Day. The Tree was planted between Avenue G & Avenue H on the West side of 6th Street in front of the Merrily Bed & Breakfast. The proprietors of the Merrily have graciously volunteered care of the Live Oak. 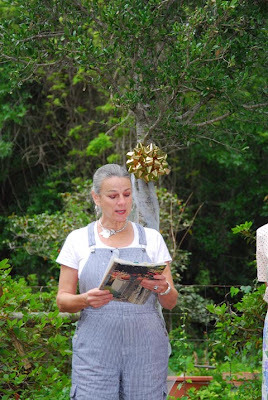 During the Ceremony Mitzy Roess read a beautiful poem followed by Nancy Crenshaw’s commemoration of the Live Oak Tree and the Arbor Day Proclamation. 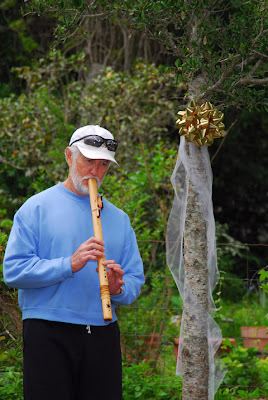 Flutist Neal Crenshaw played his Native American flute to a beautiful original piece, "Under the McIntosh Oaks." 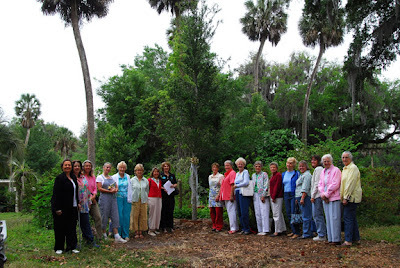 Be sure to attend the McIntosh Garden Club Annual Plant Sale this weekend and please take a moment to drive by McIntosh’s new addition and see what wonderful efforts in maintaining the beauty and character of McIntosh are being done by these fine groups and citizens of the Heart of Florida. Council members Lee Deaderick, Howard Walkup and Frank Ciotti met Monday morning at 7 a.m. in an emergency meeting and voted to spend $3,500 to automate the pump on the water system. A public record request made to Town Clerk Debbie Miller revealed that no tape was made of the meeting. When asked why the meeting was not taped especially since residents would have an interest in knowing what happened at a meeting given the short notice, Miller said in an e-mail, "There is no legal requirement to make a tape of the meeting. Legally, we were required to take minutes, and that obligation was met. It was a very short meeting. The notice for the emergency meeting was posted on Saturday morning at the office and at the community bulletin board with the intention of involving as many concerned citizens as we could on short notice." There is some question of which council members and town officials were not present, since the minutes do not make that clear. Miller did not clarify this when asked but said, "Council members were notified by phone and posted notices. I don't know what other obligations they would have had on Monday morning which would have prevented their attendance." I) Roll call was taken with Council President Ciotti, Council Vice-President Walkup, Council Member Deaderick, and Town Clerk Miller present. Council Member Callahan, Council Member Smith, Mayor Strange, and Attorney Walker. An emergency meeting was called by Council Member Deaderick to look again at automating the water plant well house after experiencing problems this past weekend. Maintenance worker Paul Kelly said that he believed the current problem involved a series of circuits which blew out on pump #1. Currently, the pump system alternates between pump #1 and pump #2, if the system is operating correctly. When one pump shuts down, the remaining pump must be initially manually controlled to keep the system working. Council Member Deaderick felt that there was money in the budget to cover the cost of automating the well pump. Council Vice-President Walkup stated that he has been working with Spencer Clark, who was also present at the meeting, to inexpensively install a telephone dialer, which would notify of a drop in water pressure to a prescribed call list. Homeowner Clark stated that he had been researching a well-type pressure drop valve or a similar device, which would better gauge water pressure and an alarm system. Discussion centered around the proposal received from Orange Electric, Inc. in January and the necessity to spend $3500 to automate the water tower or to continue operating as is. Council Member Deaderick made the motion to hire Orange Electric, Inc. at a cost of $3500 to Furnish and Install a new Duplex Well Pump Control Panel per their proposal dated January 29, 2007 and authorization for Spencer Clark to install an automated call system at a cost not to exceed $500. Council President Ciotti seconded the motion. Motion passed and carried 2-1 to accept the Orange Electric, Inc. proposal for $3500 to install a new control panel and for an automated call system to be installed at a cost not to exceed $500.. Council Vice-President Walkup opposed.